If you’ve created a number of range names in an Excel 2007 worksheet, you can use the Name Manager to work with these names. 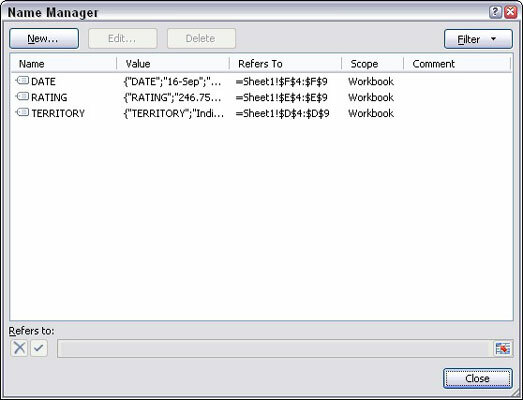 The Name Manager provides a list of all names assigned in the current workbook which you can filter, modify, or delete as needed. You can also use the Name Manager to create new range names. On the Formulas tab, click Name Manager in the Defined Names group (or press Ctrl+F3). The Name Manager dialog box appears. Use the Name Manager in Excel 2007 to add, edit, or delete range names. Click the New button, which displays the New Name dialog box in which you can enter a range name and enter the cell location it refers to. Instead of typing the range cell locations, click the Collapse button, which moves aside the New Name dialog box. You can then use your mouse to select the desired cell(s). Press Enter or click the Expand button to return to the New Name dialog box. Click an existing range name and then click the Edit button, which displays the Edit Name dialog box. Use this dialog box to change the range name or the range cell location reference. Click an existing range name and then click the Delete button. A confirmation message appears, making sure you want to delete the range name. 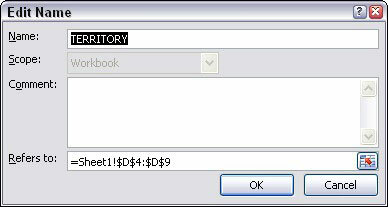 Use the Edit Name dialog box to change the name or location of a range name. Click the Close button to close the Name Manager dialog box. If you have a lot of range names, you can click the Filter button in the Name Manager dialog box and elect to display only the items meeting selected criteria, such as Table Names, Names with Errors, or Defined Names.